The idea behind Seagate’s GoFlex Satellite (s stx) is pretty cool: a 500GB drive and a Wi-Fi transmitter in a small case, which can stream your media collection to up to three Wi-Fi enabled media players at the same time, including iPads (s aapl), iPhones, and iPod touches. So when Seagate sent me a Satellite to try out, I tested it by connecting to a first-generation iPad, a 3rd-gen iPod touch, and an Android (s goog) phone. Unfortunately, I ran into significant problems. In fact, I ended up trying a second drive after Seagate had to replace the first one, but neither unit was satisfactory. The Satellite features a small 4.72in x 3.46in x 1.26in case that’s almost featureless, and weighs just over half a pound. It has a power button, ports for power and sync cables, and a couple of status lights. The drive comes with two proprietary USB cables: one for syncing your media library with your computer, and one for power. The door that covers the sync port is removable, and could easily be lost. Seagate rates the non-replaceable lithium-ion battery at up to 5 hours of continuous streaming for one user, and up to 25 hours on standby. The printed documentation for the GoFlex Satellite directs you to run installation software, which starts by opening a web page with a “getting started” video. Luckily for those of us who dislike video instructions, the page also includes a link to the Seagate website, where you can download a PDF setup guide. The software then prompts you to install and activate an old version of the Paragon NTFS driver (which I already had, but the software didn’t recognize that). This is because the drive comes formatted as NTFS for Windows(s msft), and Seagate warns that the format cannot be changed. Once you’ve installed the driver (and rebooted your Mac) you can plug in a short proprietary USB cable that lets the Satellite appear as an external drive in the Mac OS X Finder. Now you can either copy files directly from the Finder, or you can use the Seagate Media Sync software (available as a free download from Seagate’s website). I tried both approaches, but ran into several issues. The drive seemed to have a propensity for unmounting itself randomly, causing errors that had to be fixed using Apple’s Drive Utility, and in at least one case, I ended up having to reformat the drive (as NTFS). Even when the Sync software seemed to be working, it was hard to tell, because the statistics showing the space available on the drive didn’t match what the Finder was showing, and the software doesn’t include a progress bar. So I let the software churn away for a couple of hours, only to discover that nothing had actually been copied. I also got “error code -36” and even a couple of kernel panics — errors that I hadn’t seen in several years. I had slightly better luck copying via the Finder. At least that way, I could tell exactly when the drive unmounted, and could start again from there. Of course, this isn’t useful if your media collection changes frequently. At one point, I tried using the Windows version of the Media Sync software, but it doesn’t recognize network drives, so I wasn’t able to use it to access my media collection. 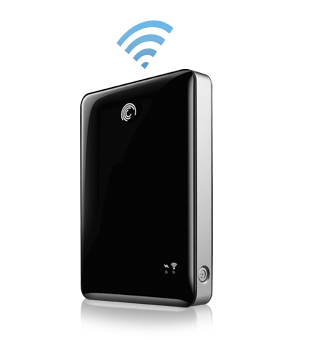 The GoFlex Satellite includes a 802.11 b/g/n Wi-Fi base station, with optional WPA security. In theory, all one has to do to stream files from the drive is select the “GoFlex Satellite” network in your player’s settings. Of course, this means disconnecting from whatever Wi-Fi network you usually use, so you won’t be able to surf the web while listening to music or watching movies. The first drive that Seagate sent me seemed to be unable to maintain a Wi-Fi signal for more than a couple of minutes. The network name would continue to appear in my player’s Settings list, but when selected, I’d frequently get an “Unable to join the network” error, which could only be resolved by power-cycling the drive. The second drive maintained a signal slightly better, but I never managed to listen to more than a couple of songs before having to reset the drive. 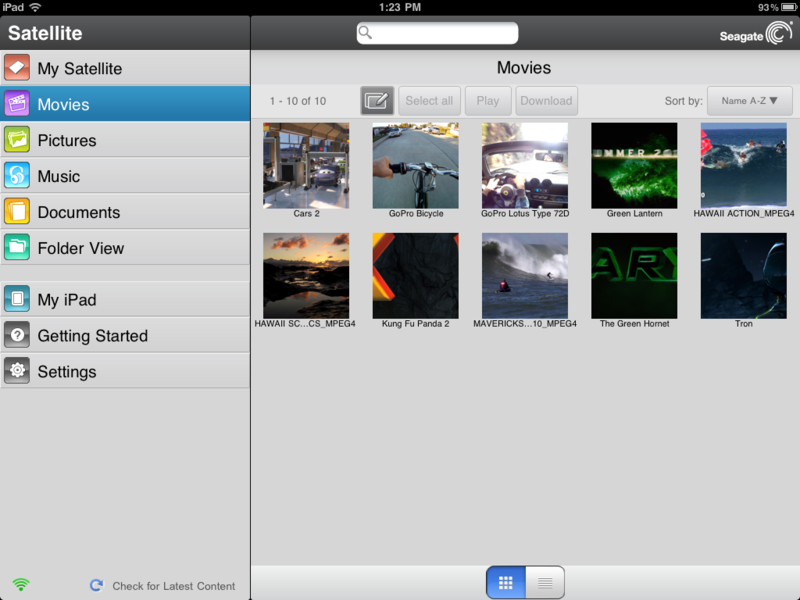 Seagate offers free iPad and iPhone/iPod touch apps for the Satellite — search for “goflex media” in the App Store. These apps, too, need a lot of work. Their layout is good-looking enough, and easy to navigate. But they are slow. Even when I managed to keep a Wi-Fi signal, it took a long time to download the folder structure from the Satellite, and I found that it often timed out. The apps’ functionality is pretty limited. The Music option displays all your music as one big list. The Folder View option shows your collection in folders, which if you’ve been using iTunes, are probably sorted by artist. The problem is that while you can select multiple items, there doesn’t appear to be any way to play multiple items once they’ve been selected. Unlike the native iOS Music app, the GoFlex Media app won’t work in the background, and if you pause while playing, your device won’t go to sleep. If you’re not using the apps, you can connect to the GoFlex Satellite through a web interface, but it has the same limitations. The concept behind the Seagate GoFlex Satellite drive is a good one, and I hope they get the bugs worked out. In the meantime, you may be better off looking at the upcoming G-Connect from Hitachi G-Technology or Kingston Wi-Drive if you’re looking for a personal cloud option. Did you try using the current driver, and rooting around in the package and installing the software if required and only if required separately? Did you report these issues to Seagate? Yes, I did, and a lot of other troubleshooting as well, which I omitted from the post for reasons of length. But a consumer product like this shouldn’t require users to jump through hoops to get it working. It’s possible that it will work better with Windows machines, but I wasn’t able to try that.